"I think land people waste a lot of time wondering why." Not to be too reductive, but movies, ultimately, are about the people in them, they're about their characters. Turn on the camera, and you capture some version of tangible reality. (Admittedly this can be skewed by where you put that camera and what it is you're shooting, but if you're working in live action, your audience will be looking at people and things.) And so when the screen is full of the stuff of life, from a particular time and place, as it should be, it's hard to get away from that kind of grounded reality. As an audience member, then, I get deeply suspicious when a movie bills itself, as this one does, as "a fable." But since the director is Giuseppe Tornatore, who made the excellent Cinema Paradiso, you may be willing to take this journey. This English-language picture from an Italian director is, disappointingly, more style than substance, and while it looks and sounds quite beautiful, there just isn't much of a motor propelling it along. The little fellow grows up in the crew's barracks, never leaving the ship, even after the untimely death of his adoptive father. And despite ample opportunities, 1900 never does get off the boat—what starts as a way to stick with the old man soon turns into an article of faith. He discovers, however, that he can play the piano like an angel—the music just pours out of him, and he becomes a main attraction on board. The movie falls short because once you're past the central conceit, there just isn't a whole lot to it. Okay, so this guy spends his whole life on this boat—what then? Of course a lot of the story is devoted to wondering whether or not 1900 will venture off the Virginian, or to giving long-winded explanations as to why he hasn't yet, but that's just not enough to fill up better than two hours of screen time. There's a nice set piece at the center of the movie, when legendary jazz pianist Jelly Roll Morton gets word that there's a boy on a ship who can play the piano, so Morton books passage and challenges 1900 to a pianistic duel. Morton is played to great effect by Clarence Williams III, more familiar to television audiences of a previous generation as Linc from The Mod Squad, and it's nice to see him here. But like so much in this movie, it's an idea that sounds better in conception than it seems in execution. The whole episode seems overly composed, so to speak, and Tornatore and his director of photography go overboard with rack focus shots, which become a little nauseating; there's also the fundamental problem of just what form a piano contest should take. But the technical elements are just lovely. 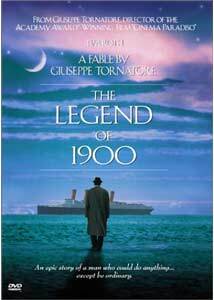 On board, in many respects this movie is a self-conscious, lighter-hearted companion piece to Titanic, and the production design is frequently magnificent; the same can be said for Ennio Morricone's score. As you watch the movie, though, you'll probably wish that all of this was in the service of a better story, better told. Image Transfer Review: An absolutely lovely transfer, with a lush, consistent palette and steady black levels. Cinematographer Lajos Koltai's work has transferred well to the small screen, and only a few nicks and scratches interfere with the image quality. Audio Transfer Review: The Dolby 5.1 is unquestionably the track of choice; balance is excellent, as are the dynamics, and the rear speakers contribute plentifully. The dialogue tends to blend in a bit too much on the DTS track, and can be rough to make out; the 2.0 track is certainly serviceable enough, if your home video setup isn't tricked out with oodles of speakers. Extras Review: The isolated music and effects track is surely the best extra on the disc, and it sounds especially good with the fine sound mix. Filmographies are provided for Roth, Tornatore and Morricone; and Roger Waters introduces the music video, for the song that plays over the closing credits. The song is amiable enough, but not nearly as memorable as 1900's own playing. Lovely to look at and listen to but rather empty at its center, The Legend of 1900 offers some fine technical work in a nice DVD transfer, but unfortunately it functions better as visual and sonic wallpaper than it does as a movie. Perhaps Tornatore will find his sea legs in future English-language pictures, or he'll rediscover his element in his native Italy, and return to form with films as fine as Cinema Paradiso.